Developer Quote: "Exclusive, 3D Digital Art Wallpapers for iPad & iPad 2 designed by our team of designers. No fuzzy backgrounds here, folks. Guaranteed!" 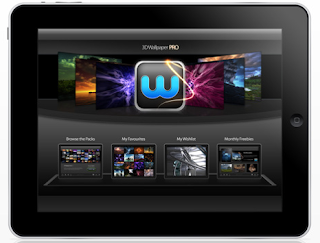 - Enjoy over 100 unique, original and exclusive 3D wallpapers for iPad and iPad 2. - Adjust each wallpaper's brightness for ultimate control. - Get free monthly updates. - Each wallpaper is hand-picked and optimized at 1365 x1024 resolution for perfect clarity in both Portrait and Landscape orientations. - Preview any wallpaper as your Homescreen or Lockscreen before you save. 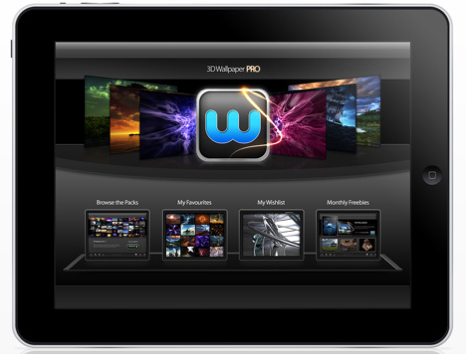 - Easy swipe browsing through Packs and Full Screen Wallpapers. - No Internet connection or Wifi needed to browse. - View all wallpapers as a slideshow, or choose just your favorites. - Share your new wallpapers via Twitter or connect to Facebook and publish them. - Email any wallpaper to family and friends. - Save your favorites for faster browsing. - Add or remove wallpapers to your Wishlist. The sleek, glossy icon of 3D Wallpaper Pro hints at just what you can expect when you open this app. 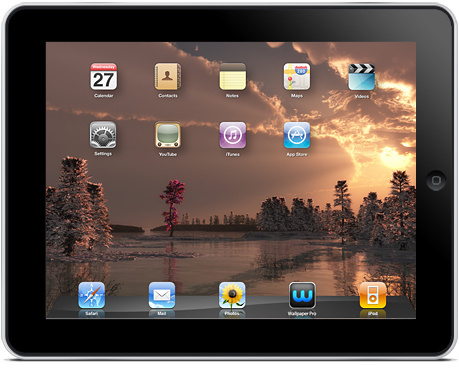 Choose from 8 packs (some from Top In App Purchases) of more than 400 beautiful iPad wallpapers. Wait till you see what kind of artwork is included here! You've got incredible digital abstracts that take your breath away and luminous landscapes that light up your screen. Add to that psychedelic fractals that will have you reeling, as well as amazing sci-fi designs, and you will be literally mesmerized by the quantity and quality of your choices. The smooth, well-designed interface of 3D Wallpaper Pro makes it easy to get around whether it's to browse the Pack, Favorites, Wishlist, or Monthly Freebies. Swipe through packs and then zoom in on each image to see which you may prefer. If you'd like to lighten your pic, go ahead and do so with the special control. If you are the more mysterious type, then go for a slightly darkened look by adjusting your control that way. View Your Collection where you can share your specially chosen backgrounds with friends on Facebook and Twitter. If not, e-mail them out to get opinions on your choices. Try out the look of your selection by previewing it with one tap before you save it. Feel like relaxing? Go ahead and strike up a slideshow to savor while playing your music. Oh, and remember, you will continue to receive free monthly wallpaper updates, so your collection will never become stale! COOL CONCLUSION: "The stunning and sensational iPad designs included in 3D Wallpaper Pro are a cut way above all others." --Special Note: BANK HOLIDAY LAUNCH PRICE - 67% OFF. 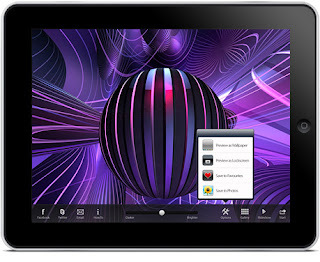 --Facebook: 3D Wallpaper Pro - Wallpaper App for iPad & iPad 2.